Barça lose first leg 2-0 in Quarter-Finals Copa clash to Sevilla. 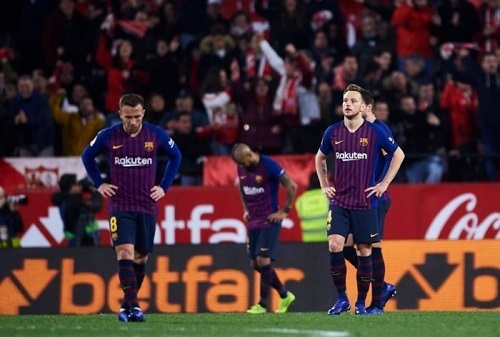 FC Barcelona continued their losing habit of losing in the first leg of their Copa del Rey fixtures with a 2-0 away loss to Sevilla. After a scoreless first half, Sevilla outperformed a Barça side missing Messi, but saw the debut of Kevin-Pring Boateng, and scored through Pablo Sarabia and Wissam Ben Yedder. The Blaugrana will need a strong performance to overcome this result next week at the Camp Nou. They will now have to shift their attention to this Sunday’s fixture against Girona as they continue to remain league leaders. Sevilla: Soriano, Mercado, Kjaer, Sergi Gómez, Navas (André Silva, 69′), Banega, Amadou, Sarabia (Franco Vázquez, 65′), Escudero (Arana, 88′), Promes & Ben Yedder. FC Barcelona: Cillessen, Sergi Roberto, Piqué, Lenglet, Semedo (Jordi Alba, ,80′), Rakitic, Arthur, Aleñá, Vidal, Malcom (Coutinho, 53′) & Prince Boateng (Suárez, 53′). Goals: 1-0, Sarabia (57′). 2-0, Ben Yedder (77′). Cautions: Sergi Gómez (73′); Jordi Alba (84′). Previous PostBarça Announce Loan Agreement for Kevin-Prince Boateng.